Habit: Plant 6--50 cm, decumbent to erect, glandular, not strongly scented. Stem: not purple-streaked. Leaf: < 6 cm, linear to oblanceolate; proximal leaves lobed > 1/2 to midvein. Inflorescence: peduncle 1--10 cm; involucre 5--10+ mm diam, hemispheric to +- urn-shaped; phyllaries 5--9 mm, tip < or > folded base, basal margins interlocked by cobwebby hairs. Ray Flower: 6--15; ray 3--14 mm, proximally yellow, distally white. Disk Flower: 16--100+; corolla 3.5--5 mm; anthers +- dark purple. Fruit: ray fruit glabrous or sparsely hairy, +- dull; disk pappus of 9--12 scales, 2--3.5 mm, +- equal, lance-linear, distally long-tapered, +- white, +- scabrous, not adaxially woolly, base sparsely bristly. Chromosomes: 2n=14. 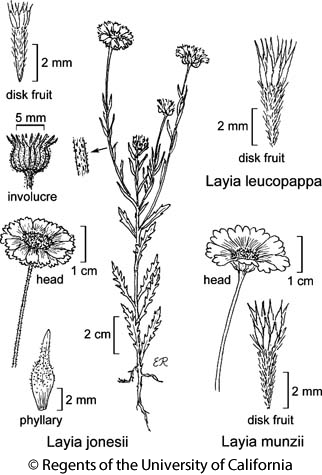 Citation for this treatment: Bruce G. Baldwin & Susan J. Bainbridge 2012, Layia munzii, in Jepson Flora Project (eds.) Jepson eFlora, http://ucjeps.berkeley.edu/eflora/eflora_display.php?tid=3754, accessed on April 23, 2019. © 1998 Robert E. Preston, Ph.D.